Proximal humeral fractures in elderly patients present with severe comminution and osteoporotic bone quality. Reverse shoulder arthroplasty has lately been proven beneficial in treating patients with complex proximal humeral fractures. The above technique is recommended and has better results in elderly than in younger individuals. We performed a literature search in the databases Pubmed, Medline, EMBASE and Cochrane Library for published articles between 1970 and 2016 using the terms: proximal humerus fractures and reverse shoulder arthroplasty. Significant benefits with the use of reverse prosthesis, especially in patients older than 70 years with a proximal humeral fracture, include reduced rehabilitation time as well as conservation of a fixed fulcrum for deltoid action in case of rotator cuff failure. Compared with hemiarthroplasty and internal fixation, reverse prosthesis may be particularly useful and give superior outcomes in older patients, due to comminuted fractures in osteopenic bones. However, significant disadvantages of this technique are potential complications and a demanding learning curve.Therefore, trained surgeons should follow specific indications when applying the particular treatment of proximal humeral fractures and be familiar with the surgical technique. Although long-term results and randomized studies for reverse prosthesis are lacking, short and mid- term outcomes have given promising results encouraging more shoulder surgeons to use this type of prosthesis in proximal humeral fractures. Keywords: Elderly, proximal humerus fractures, Reverse shoulder prosthesis, Fragility, Shoulder hemiarthroplasty, Internal fixation, Tuberosities fracture. Proximal humeral fractures are frequently seen in adults and account for about 5% of all fractures with an increasing rate in elderly population [1, 2]. The majority of proximal humeral fractures do not require surgical operation and can have excellent outcomes following conservative treatment [3-5]. Reverse shoulder arthroplasty (RSA) is an alternative treatment for complex 3 and for 4part proximal humeral fractures in elderly population with encouraging early results and patient outcomes [11-14]. Nonoperative management involves systematic analgesia and sling immobilization. Generally, it is best preserved for non-displaced fractures of the proximal humerus or for patients medically unsuitable for surgery. When compared to prolonged immobilization, early physiotherapy starting two weeks after injury was found to have better outcomes [15, 16]. Three and 4-part fractures have been treated nonoperatively but with poor results. Predicting the outcome of 3 or 4-part fractures treated conservatively is difficult, and a patient’s decision not to undergo surgery may have its own untoward consequences. Complications encountered with conservative treatment of these fractures include malunion and nonunion, subacromial impingement, avascular necrosis of the humeral head, stiffness secondary to osteoarthritis rotator cuff deficiency and shoulder pain. Malunions of the proximal humerus can cause serious restriction in external rotation and abduction from a mal-positioned greater tuberosity fragment. Osteonecrosis can also cause humeral head collapse, leading to degenerative changes of the glenohumeral joint, although some patients with osteonecrosis may still have a satisfactory outcome  Recent studies [4, 18] noted good functional results with nonoperative management. However, the majority of the fractures included were non-displaced or minimally displaced. If the humerus heals in a severely malunited position, the shoulder may not be amenable to future reconstruction with a standard total shoulder arthroplasty making RSA the necessitate treatment for these conditions. Surgery should at least be considered in active and healthy patients with 3- and 4-part fractures because it can potentially restore anatomy and consequently improve function. Younger adults with adequate bone quality can benefit more from open reduction and internal fixation with the use of locking plate osteosynthesis. The technique can have positive outcomes especially in large and solid tuberosity fracture fragments. After the introduction of locking plates indications for this type of treatment were increased but recent studies showed a high rate of complications such as fracture displacement, screw cut out up to 57%, intra-articular migration of screws and avascular necrosis of humeral head up to 55% [19, 20] (Fig. 1). Two requirements for avoiding the risk of fixation failure are the anatomical reduction and the restoration of the neck-shaft angle. On the other hand, a number of studies support the use of medial support screws as a main method of maintaining reduction of unstable three- and four-part fractures (Fig. 2). A study evaluating the outcomes of complex proximal humeral fractures in the elderly  resulted in a 51% early failure rate and a 26% need for reoperation in the treatment of 82 shoulders with osteosynthesis. Authors concluded that osteosynthesis of these fractures with locking plates had lower but significant rate of malunions and malpositioning of fracture fragments preventing patients from acceptable outcomes. Fig. (1). 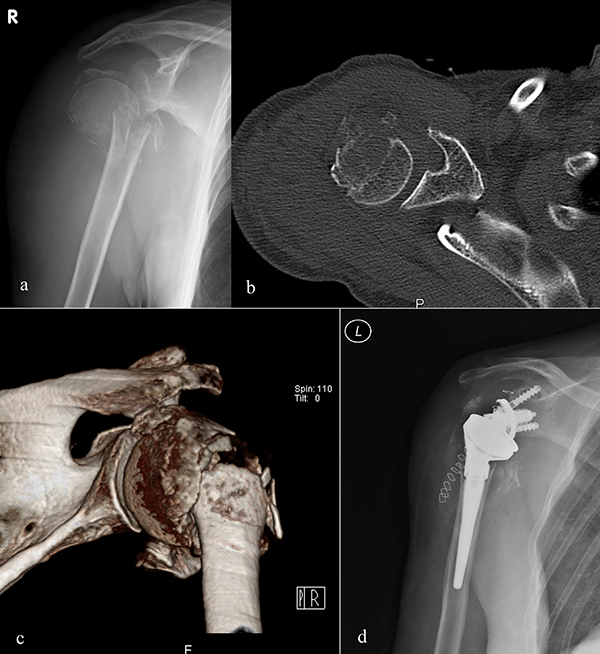 Avascular necrosis and screw penetration of humeral head following plate osteosynthesis of a 4-part proximal humeral fracture. Fig. (2). Proximal humeral head fracture with extension to the shaft (a) treated with plate osteosynthesis (b). Neer  was the first to introduce hemiarthroplasty as a treatment alternative. It offers a good solution for comminuted 3 and 4-part fractures of proximal humerus (Fig. 3) providing pain relief and outcomes ranging between excellent and poor. Key point for hemiarthroplasty success is tuberosities healing  which offers satisfactory outcomes and good range of motion. In case of tuberosity resorption, nonunion, or malunion poor outcomes are often seen. Long-term follow-up of such fractures treated with hemiarthroplasty verify pain relief but vary in functional outcomes [24, 25]. It appears that better results can be obtained in younger patients and patients with less comminuted tuberosities. Improper retroversion, poor tuberosity positioning, and excessive prosthetic height have been implicated as factors associated with poor functional results. Complications include aseptic loosening, dislocation, infection and reflex sympathetic dystrophy. Other type of complications may include subacromial impingement, intraoperative or periprosthetic fractures, rotator cuff dysfunction secondary to tuberosity displacement and resorption and heterotopic ossification . In combination with older age, implant malpositioning, increasing degree of tuberosity displacement, or even a persistent neurological deficit, these can lead to poor outcomes, creating the need for early re-operation and use of hemiarthroplasty for salvage of previous failed procedures [27, 28]. Failures due to improperly functioning rotator cuff often requiring additional surgery according to some long-term follow-up studies. Therefore, hemiarthroplasty offers significant pain relief but variable range of motion and outcome that often depends on tuberosity malposition and nonunion. When hemiarthroplasty is used, proper implant position and tuberosity reduction and fixation are critical. Fig. (3). X-ray (a) and 3D reconstruction CT (b) of a 4-part humeral head fracture treated with hemiarthroplasty (c). A technique by Paul Grammont called Reverse Shoulder Arthroplasty (RSA) was initially proposed for the treatment of glenohumeral arthritis with rotator cuff arthropathy [29, 30], however, it is nowadays used for numerous indications like rotator cuff deficiency and proximal humeral fractures. Moreover, the technique has been applied for fracture complications such as malunion or nonunion, chronic dislocations, and revision arthroplasty [10, 11]. The above technique has become a pioneer treatment option for several complex shoulder injuries and disorders of the elderly, providing adequate deltoid elongation and decreasing the forces required to abduct the arm by medializing the center of rotation, overriding the presence of a dysfunctional rotator cuff . In order to improve external rotation of the arm and decrease scapular notching, implants with a lateralized glenosphere have been used . New designs as BIO-RSA (Tornier, Warsaw, USA) support this idea recently. Indications for treating proximal humeral fractures with reverse shoulder arthroplasty are elderly individuals (>70 years) with non-reconstructable tuberosities and patients with high-risk fractures of poor functional potential outcome if treated with ORIF or Hemiarthroplasty (i.e. pre- existing rotator cuff tear and arthritis, high likelihood of humeral head osteonecrosis, osteoporotic bone). Contraindications include malfunction of axillary nerve, deltoid dysfunction, scapular or acromion fracture as well as open fractures due to high risk of infection. Reverse shoulder prosthesis utilizes the deltoid function and establishes improved kinetics when there is substantial rotator cuff dysfunction or absence of tuberosities healing. The post-operative goals are improved clinical function and relief of pain [33, 34]. The surgical approach for RSA has been either the standard deltopectoral approach or the anterosuperior approach. Each approach has its benefits and disadvantages. The deltopectoral approach (DP) is the universal and familiar approach to the shoulder. It allows adequate access to the fracture fragments for suture fixation and provides adequate glenoid exposure after fracture fragment mobilization. Also, reducing trauma to the deltoid has a theoretic advantage, given that reverse arthroplasty is powered primarily by the deltoid muscle. However, deltopectoral approach has several disadvantages. The role of the subscapularis though, in function and stability of a reverse arthroplasty is controversial. Several studies have associated subscapularis dysfunction with greater risk of instability as well as increased danger of nerve injury [35-37]. Also, visualization and instrumentation of the posterior glenohumeral structures can be difficult from an anterior approach making the exposure and reduction of the greater tuberosity or the implantation of the base plate a demanding procedure. The anterosuperior approach (AS) uses a more limited superior incision via deltoid split. The deltoid is split between its anterior and middle thirds, starting at the anterolateral corner and extending distally up to 4 cm. The positive outcomes gained when using this technique are the adequate exposure of the glenoid, the better access to the greater tuberosity and the ability to preserve the subscapularis tendon whilst reducing the risk of dislocation. Also, preserving the anterior soft tissue structures provides a compressive effect that may reduce the need to lengthen the arm for stability thus potentially reducing the incidence of neurologic damage or fracture of the acromion . However, the surgeon that will select the AS approach, will probably face difficulties in placing the glenoid baseplate in a neutral or an inferiorly tilted position as well as the exposure humeral shaft due to the limited extensibility of the approach. The requirement for deltoid detachment and potential dehiscence or weakening (damage to the distal branches of axillary nerve) that may lead to postoperative pain or dysfunction. Mole et al. performed a multicenter study comparing instability, function and pain scores, scapular notching, and complications in the AS (n = 227) and DP (n = 300) approaches. In 527 reverse arthroplasties with a minimum 2-year follow-up, postoperative instability rate was greater with the DP (5.1%) than with the AS (0.8%) approach (P<.001). Scapular notching occurred in 74% of AS approaches and 63% of DP approaches (P 0 .03). Acromial fractures occurred in 5.6% of DP approaches and 2.2% of AS approaches (P 0 .02).No differences in Constant-Murley score or active mobility were found. When it comes to the treatment of proximal humeral fractures we prefer the deltopectoral approach with the use of reverse shoulder arthroplasty. Although restoring rotator cuff is not obligatory for RSA to be functional for arm elevation, repairing the grater tuberosity and the function of the infraspinatus and teres minor can lead to improved external rotation strength and function. Tuberosity fixation to the implant and shaft remains important for the proximal humeral fractures treatment with RSA. Recent studies have shown that improved rotation may be obtained if the tuberosities are repaired anatomically to the RSA implant . With the increased number of fractures treated with RSA, modern humeral stems offer accelerated healing of tuberosities. Some humeral prosthesis have proximal ingrowth potential to control fragments; others are coated with hydroxyapatite or have windows in the proximal stem for better bone grafting from humeral head to enhance tuberosity integration . Few studies have investigated the role of lesser tuberosity-subscapularis repair with controversial results [40-42]. A deficient subscapularis predisposes the prosthesis to anterior instability, placing additional demands and requiring attention. Moreover, caution is required when repairing the subscapularis, whereby the remaining external rotators may be weakened in the effort to increase the overall internal rotation. Gallinet et al. in their study found that patients with anatomic healing of the tuberosities had improved forward elevation, external rotation at the side and at 90o of abduction when compared with patients who had nonunion or malunion of the greater tuberosity. Patients with healed tuberosities also had improved Constant and DASH scores. We believe that tuberosity repair is a necessary procedure for the RSA when used for fractures. We prefer to repair tuberosities with nonabsorbable sutures and careful handling of the tuberosities. The sutures can be placed before glenosphere placement because the implant may limit one’s ability to suture the greater tuberosity. Additionally, vertical sutures are also placed to secure the shaft to the tuberosities in order to avoid proximal migration of the tuberosities to the implant. RSA longevity and impingement-free range of motion depend on implant positioning and prosthetic design. The baseplate should be positioned inferiorly on the glenoid to limit scapular notching. In order to achieve that, inferior capsular release is essential for glenoid exposure for proper baseplate positioning. The three -column concept has been introduced for fixation and positioning of the glenoid baseplate . Newer studies support the perpendicular position of the lower screw in order to avoid complications after notching and support superior fixation . One screw is aimed at the coracoid, one toward the scapular spine, and one down the lateral pillar. Recent studies have shown that the glenoid baseplate may only need 2 screws for adequate fixation. Glenoid component positioning is an important factor in total shoulder arthroplasty. Preoperative planning should include CT with three-dimensional (3D) reconstruction for better imaging of glenoid retroversion, inclination, and humeral head subluxation [45, 46]. Inferior tilting of the glenosphere has been proposed from the majority of the published studies although this position may lead to earlier contact of the humerus with the lateral scapula [47, 48]. Increased varus humeral neck-shaft angle has been correlated with less adduction deficits and scapular notching . Rotation of the prosthesis affects range of motion, stability of the arthroplasty and tuberosity healing. Less humeral retroversion leads to decreased external rotation before impingement . We prefer 20o retroversion with regard to the forearm of the patient. Adequate soft tissue tensioning is an important factor for the stability and proper deltoid function that leads to better outcomes. Both horizontal and axial tension is important to consider. Lengthening of the arm up to 1.5 cm leads to sufficient deltoid tension and improved forward flexion [50, 51]. However, the humerus should not be lengthened more than 2.5 cm compared with the opposite side because overlengthening has been correlated with neurologic complications, deltoid fatigue and stress fracture of the acromion [10, 31]. Recent studies have shown promising results for RSA in proximal humeral fractures treatment (Fig. 4). Klein et al. investigated 20 patients with a mean follow up of 33 months and found improvement of Constant and SF 36 scores close to age-related norms when the Delta III RSA (Depuy Orthopaedics, Warsaw, IN) was used for acute fractures in the elderly. Bufquin et al. prospectively evaluated the use of RSA for the treatment of 3- and 4-part fractures in elderly with a mean follow up of 22 months. Fig. (4). X-Ray (a), CT (b) and 3D reconstruction CT (c) of a 4-part humeral head fracture treated with reverse shoulder arthroplasty. He concluded that tuberosity nonunion may not pose a threat to the final outcome and that the RSA technique/method is the recommended option for patients suffering both comminuted tuberosities and osteoporosis. Although these initial reports have shown good results, further studies have disclosed the high incidence of scapular notching, neurologic complications, and component loosening seen at midterm follow-up using the RSA for the treatment of fractures. According to previous studies, RSA in patients for proximal humeral fractures has shown better outcomes at short and midterm follow-up with forward flexion improvement, compared to hemiarthroplasty [53, 54]. Limitations of these studies are retrospective design, small population with short follow-up period and heterogeneity of the results . Finally RSA can also be used as a salvage procedure after failure of internal fixation of proximal humeral fractures with a recently published study showing 79% of the patients with excellent outcomes . Complication rates in the literature have ranged from 0% to 68%  including complex regional pain syndrome, wound infection, scapular notching, hematoma, nerve injuries, instability, early loosening and periprosthetic fracture. The procedure has a steep learning curve; however, the complication rate has shown decrease after 40 cases . Scapular notching is a radiographic finding due to a reaction to prosthesis material (polyethylene) with high incidence (up to 96%) especially with Grammont-style prosthesis [59, 60]. Reaction begins with contact between the scapular neck and the polyethylene during adduction and can result to baseplate fixation, poor outcomes and prosthesis failure . It has been correlated with superior positioning of the glenosphere, medialization of the center of rotation and high body mass. Instability is common after reverse prosthesis with rates of dislocation reported as high as 30% [4, 61] (Fig. 5). Post -operative complications may be the result of either soft tissue tension, glenosphere diameter, or humeral- socket constraint, impingement, and deltoid dysfunction. According to Gutierrez et al. a number of factors of prosthetic design, including the compressive force on the prosthesis, the prosthetic socket depth, and the glenosphere size may be related to dislocation. According to their study, increasing the compressive forces on the prosthesis followed by humerosocket depth lead to improved stability. Furthermore, stability of the reverse shoulder arthroplasty may be achieved by lengthening the humerus. Yet, increasing humeral length poses a threat for deltoid over-tensioning and loss of motion, acromion stress fracture and brachial plexopathy . 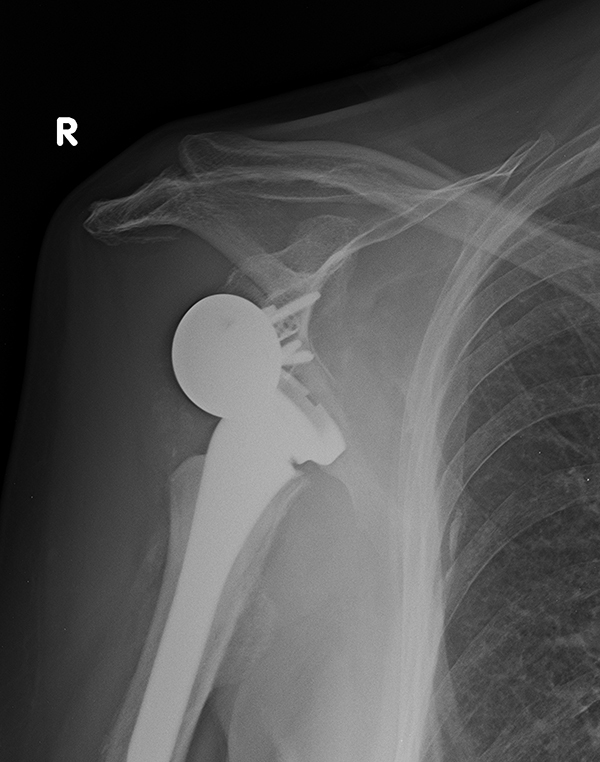 Infection of a reverse shoulder arthroplasty has been reported as high as 4% and could be a catastrophic with difficult management complication . The most common micro-organism found are Propionibacterium acnes and Staphylococcus epidermidis [63, 64]. Fig. (5). 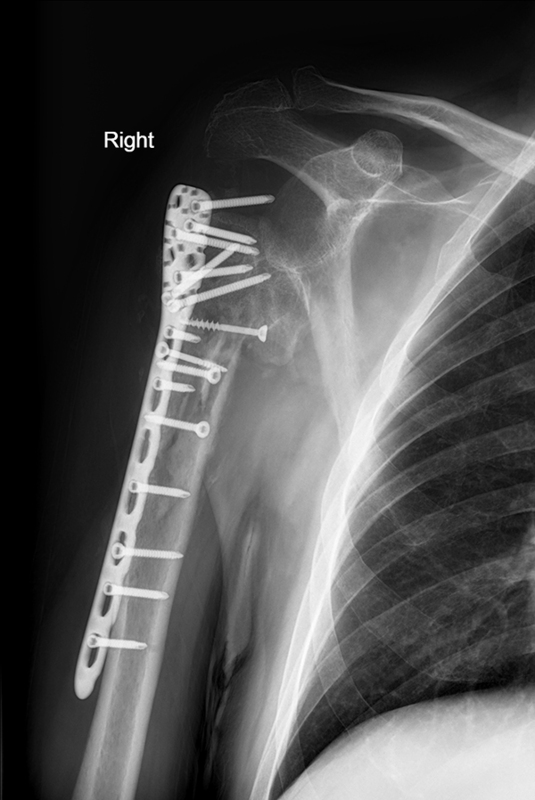 Dislocation of a reverse shoulder arthroplasty. Comminuted proximal humerus fractures in the elderly may present a number of drawbacks. RSA technique has become a successful tool for dealing with some of these drawbacks. Careful preoperative planning and attention in tuberosity fixation are important factors in order to achieve good clinical outcomes. Short-term results of comparative studies between RSA and Hemiarthroplasty showed improved forward flexion, abduction and Constant scores in patients treated with RSA. Long term follow up studies as well as randomized studies are needed to be done in order to give safe conclusions for the use of RSA in proximal humeral fractures. Palvanen M, Kannus P, Niemi S, Parkkari J. Update in the epidemiology of proximal humeral fractures. Clin Orthop Relat Res 2006; 442(442): 87-92. Koval KJ, Gallagher MA, Marsicano JG, Cuomo F, McShinawy A, Zuckerman JD. 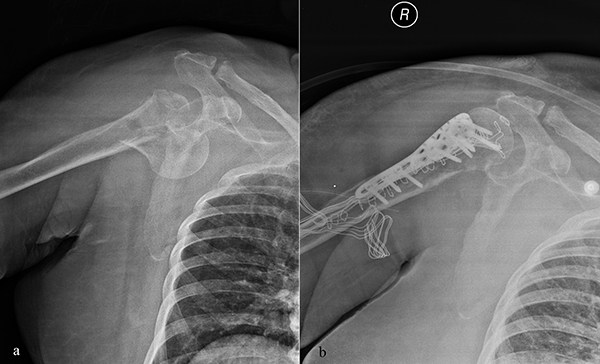 Functional outcome after minimally displaced fractures of the proximal part of the humerus. J Bone Joint Surg Am 1997; 79(2): 203-7. Court-Brown CM, Garg A, McQueen MM. The translated two-part fracture of the proximal humerus. Epidemiology and outcome in the older patient. J Bone Joint Surg Br 2001; 83(6): 799-804. Hanson B, Neidenbach P, de Boer P, Stengel D. Functional outcomes after nonoperative management of fractures of the proximal humerus. J Shoulder Elbow Surg 2009; 18(4): 612-21. Gaebler C, McQueen MM, Court-Brown CM. Minimally displaced proximal humeral fractures: epidemiology and outcome in 507 cases. Acta Orthop Scand 2003; 74(5): 580-5. Bhandari M, Matthys G, McKee MD. Four part fractures of the proximal humerus. J Orthop Trauma 2004; 18(2): 126-7. Cazeneuve JF, Cristofari DJ. The reverse shoulder prosthesis in the treatment of fractures of the proximal humerus in the elderly. J Bone Joint Surg Br 2010; 92(4): 535-9. Sirveaux F, Navez G, Favard L, Boileau P, Walch G, Mole D. The Multi-centere Study. In: Walch G, Boileau P, Mole D, Eds. Reverse Shoulder Arthroplasty: Clinical Results, Complications, Revision. Montpellier, France: Sauramps Medical 2006; pp. 73-80. Lenarz C, Shishani Y, McCrum C, Nowinski RJ, Edwards TB, Gobezie R. Is reverse shoulder arthroplasty appropriate for the treatment of fractures in the older patient? Early observations. Clin Orthop Relat Res 2011; 469(12): 3324-31. Gallinet D, Adam A, Gasse N, Rochet S, Obert L. Improvement in shoulder rotation in complex shoulder fractures treated by reverse shoulder arthroplasty. J Shoulder Elbow Surg 2013; 22(1): 38-44. Kristiansen B, Angermann P, Larsen TK. Functional results following fractures of the proximal humerus. A controlled clinical study comparing two periods of immobilization. Arch Orthop Trauma Surg 1989; 108(6): 339-41. Lefevre-Colau MM, Babinet A, Fayad F, et al. Immediate mobilization compared with conventional immobilization for the impacted nonoperatively treated proximal humeral fracture. A randomized controlled trial. J Bone Joint Surg Am 2007; 89(12): 2582-90. Gerber C, Werner CM, Vienne P. Internal fixation of complex fractures of the proximal humerus. J Bone Joint Surg Br 2004; 86(6): 848-55. Iyengar JJ, Devcic Z, Sproul RC, Feeley BT. Nonoperative treatment of proximal humerus fractures: a systematic review. J Orthop Trauma 2011; 25(10): 612-7. Jost B, Spross C, Grehn H, Gerber C. Locking plate fixation of fractures of the proximal humerus: analysis of complications, revision strategies and outcome. J Shoulder Elbow Surg 2013; 22(4): 542-9. Ricchetti ET, Warrender WJ, Abboud JA. Use of locking plates in the treatment of proximal humerus fractures. J Shoulder Elbow Surg 2010; 19(2)(Suppl. ): 66-75. Smith AM, Mardones RM, Sperling JW, Cofield RH. Early complications of operatively treated proximal humeral fractures. J Shoulder Elbow Surg 2007; 16(1): 14-24. Neer CS II. Displaced proximal humeral fractures. II. Treatment of three-part and four-part displacement. J Bone Joint Surg Am 1970; 52(6): 1090-103. Boileau P, Walch G, Krishnan S. Tuberosity osteosynthesis and hemiarthroplasty for four-part fractures of the proximal humerus. Tech Shoulder Elbow Surg 2000; 1: 96-109. Antuña SA, Sperling JW, Cofield RH. Shoulder hemiarthroplasty for acute fractures of the proximal humerus: a minimum five-year follow-up. J Shoulder Elbow Surg 2008; 17(2): 202-9. Robinson CM, Page RS, Hill RM, Sanders DL, Court-Brown CM, Wakefield AE. Primary hemiarthroplasty for treatment of proximal humeral fractures. J Bone Joint Surg Am 2003; 85-A(7): 1215-23. Esen E, Doğramaci Y, Gültekin S, et al. Factors affecting results of patients with humeral proximal end fractures undergoing primary hemiarthroplasty: a retrospective study in 42 patients. Injury 2009; 40(12): 1336-41. Taller S, Krivohlávek M, Lukás R, Srám J, Král M. [Hemiarthroplasty for management of proximal humeral fractures]. Acta Chir Orthop Traumatol Cech 2007; 74(4): 262-7. Baulot E, Sirveaux F, Boileau P. Grammonts idea: The story of Paul Grammonts functional surgery concept and the development of the reverse principle. Clin Orthop Relat Res 2011; 469(9): 2425-31. Henninger HB, Barg A, Anderson AE, Bachus KN, Tashjian RZ, Burks RT. Effect of deltoid tension and humeral version in reverse total shoulder arthroplasty: a biomechanical study. J Shoulder Elbow Surg 2012; 21(4): 483-90. Cuff D, Pupello D, Virani N, Levy J, Frankle M. Reverse shoulder arthroplasty for the treatment of rotator cuff deficiency. J Bone Joint Surg Am 2008; 90(6): 1244-51. Wall B, Nové-Josserand L, OConnor DP, Edwards TB, Walch G. Reverse total shoulder arthroplasty: a review of results according to etiology. J Bone Joint Surg Am 2007; 89(7): 1476-85. Frankle M, Siegal S, Pupello D, Saleem A, Mighell M, Vasey M. The Reverse Shoulder Prosthesis for glenohumeral arthritis associated with severe rotator cuff deficiency. A minimum two-year follow-up study of sixty patients. J Bone Joint Surg Am 2005; 87(8): 1697-705. Edwards TB, Williams MD, Labriola JE, Elkousy HA, Gartsman GM, OConnor DP. Subscapularis insufficiency and the risk of shoulder dislocation after reverse shoulder arthroplasty. J Shoulder Elbow Surg 2009; 18(6): 892-6. Trappey GJ IV, OConnor DP, Edwards TB. What are the instability and infection rates after reverse shoulder arthroplasty? Clin Orthop Relat Res 2011; 469(9): 2505-11. Molé D, Wein F, Dézaly C, Valenti P, Sirveaux F. Surgical technique: the anterosuperior approach for reverse shoulder arthroplasty. Clin Orthop Relat Res 2011; 469(9): 2461-8. Bufquin T, Hersan A, Hubert L, Massin P. Reverse shoulder arthroplasty for the treatment of three- and four-part fractures of the proximal humerus in the elderly: a prospective review of 43 cases with a short-term follow-up. J Bone Joint Surg Br 2007; 89(4): 516-20. Clark JC, Ritchie J, Song FS, et al. Complication rates, dislocation, pain, and postoperative range of motion after reverse shoulder arthroplasty in patients with and without repair of the subscapularis. J Shoulder Elbow Surg 2012; 21(1): 36-41. Humphrey CS, Kelly JD II, Norris TR. Optimizing glenosphere position and fixation in reverse shoulder arthroplasty, Part Two: The three-column concept. J Shoulder Elbow Surg 2008; 17(4): 595-601. Parsons BO, Gruson KI, Accousti KJ, Klug RA, Flatow EL. Optimal rotation and screw positioning for initial glenosphere baseplate fixation in reverse shoulder arthroplasty. J Shoulder Elbow Surg 2009; 18(6): 886-91. Walch G, Vezeridis PS, Boileau P, Deransart P, Chaoui J. Three-dimensional planning and use of patient-specific guides improve glenoid component position: an in vitro study. J Shoulder Elbow Surg 2015; 24(2): 302-9. Iannotti J, Baker J, Rodriguez E, et al. Three-dimensional preoperative planning software and a novel information transfer technology improve glenoid component positioning. J Bone Joint Surg Am 2014; 96(9): e71. Edwards TB, Trappey GJ, Riley C, OConnor DP, Elkousy HA, Gartsman GM. Inferior tilt of the glenoid component does not decrease scapular notching in reverse shoulder arthroplasty: results of a prospective randomized study. J Shoulder Elbow Surg 2012; 21(5): 641-6. Nyffeler RW, Werner CM, Gerber C. Biomechanical relevance of glenoid component positioning in the reverse Delta III total shoulder prosthesis. J Shoulder Elbow Surg 2005; 14(5): 524-8. Gutiérrez S, Levy JC, Frankle MA, et al. Evaluation of abduction range of motion and avoidance of inferior scapular impingement in a reverse shoulder model. J Shoulder Elbow Surg 2008; 17(4): 608-15. Boileau P, Watkinson DJ, Hatzidakis AM, Balg F. Grammont reverse prosthesis: design, rationale, and biomechanics. J Shoulder Elbow Surg 2005; 14(1)(Suppl. S): 147S-61S. Lädermann A, Walch G, Lubbeke A, et al. Influence of arm lengthening in reverse shoulder arthroplasty. J Shoulder Elbow Surg 2012; 21(3): 336-41. Klein M, Juschka M, Hinkenjann B, Scherger B, Ostermann PA. Treatment of comminuted fractures of the proximal humerus in elderly patients with the Delta III reverse shoulder prosthesis. J Orthop Trauma 2008; 22(10): 698-704. Gulotta LV. Reverse shoulder arthroplasty provided better functional outcomes than hemiarthroplasty for acute proximal humeral fractures. J Bone Joint Surg Am 2015; 97(10): 861. Hussey MM, Hussey SE, Mighell MA. Reverse shoulder arthroplasty as a salvage procedure after failed internal fixation of fractures of the proximal humerus: outcomes and complications. Bone Joint J 2015; 97-B(7): 967-72. Acevedo DC, Vanbeek C, Lazarus MD, Williams GR, Abboud JA. Reverse shoulder arthroplasty for proximal humeral fractures: update on indications, technique, and results. J Shoulder Elbow Surg 2014; 23(2): 279-89. Kempton LB, Ankerson E, Wiater JM. A complication-based learning curve from 200 reverse shoulder arthroplasties. Clin Orthop Relat Res 2011; 469(9): 2496-504. Simovitch RW, Zumstein MA, Lohri E, Helmy N, Gerber C. Predictors of scapular notching in patients managed with the Delta III reverse total shoulder replacement. J Bone Joint Surg Am 2007; 89(3): 588-600. De Wilde LF, Van Ovost E, Uyttendaele D, Verdonk R. [Results of an inverted shoulder prosthesis after resection for tumor of the proximal humerus]. Rev Chir Orthop Repar Appar Mot 2002; 88(4): 373-8. [in French]. Gutiérrez S, Keller TS, Levy JC, Lee WE III, Luo Z-P. Hierarchy of stability factors in reverse shoulder arthroplasty. Clin Orthop Relat Res 2008; 466(3): 670-6. Richards J, Inacio MC, Beckett M, et al. Patient and procedure-specific risk factors for deep infection after primary shoulder arthroplasty. Clin Orthop Relat Res 2014; 472(9): 2809-15. Klatte TO, Junghans K, Al-Khateeb H, et al. Single-stage revision for peri-prosthetic shoulder infection: outcomes and results. Bone Joint J 2013; 95-B(3): 391-5.